For almost a decade it seemed Roger Federer was guest of honour on finals day at nearly every Grand Slam event but over the past 12 months Novak Djokovic and Rafa Nadal have conspired to strike him off the list. So regular were his appearances in the finals that, when he was absent, it felt a little like attending a Madonna concert where the Queen of Pop failed to show up. Unfortunately for Federer, considered the most gifted player to have swung a tennis racket, his run of success has dried up and he is not happy being just one of the crowd. Wimbledon, US Open and Australian Open champion Djokovic and Nadal have split the last nine major trophies between them and they have also contested the last four Slam finals. Federer feels it is time someone gatecrashes their party and winning a record-equalling seventh Wimbledon crown would be a good start. "It's my time of the year now," said Federer who was kitted out in a collared, long-sleeved cream jumper complete with purple trim and a green 'RF' logo embossed on the upper right arm. "I fancy my chances here and at the US Open. It's exciting times ahead," he said at Wimbledon. It seems each time one of the trio reaches a final, a host of records are on the line. Over the next 43 days they will be chasing not only a Wimbledon crown but the number one ranking is also up for grabs, as is the Olympic gold medal when the All England Club hosts the tennis event during the London Games. It is no wonder that Nadal, who has already bagged 11 majors, relishes the challenge of playing in this era. "I feel very lucky to be part of these two rivalries. It's something that brings special motivation to my game, the motivation to keep improving my tennis," said Nadal who won a record seventh French Open title two weeks ago. 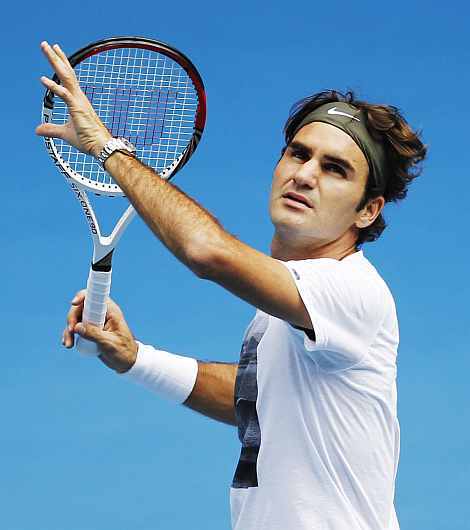 "If you are not able to improve your level you are dead in this very competitive world of tennis." Federer is aware many people have written his tennis obituary over the past two years, especially after being knocked out in the Wimbledon quarter-finals in 2010 and 2011, and he is determined to show he can rise from the ashes. "I want to do better. I have to do better in this event," said the Swiss who was beaten here by Tomas Berdych in 2010 and Jo-Wilfried Tsonga last year. "I could have gone further the last couple (of years). Maybe the other guys were just too good. Maybe I wasn't quite at my best. Who knows what the combination was? "But it's up to me to make that difference now and take it to the next step. Then once hopefully I am there, I can reach for the title. "A seventh would be amazing. 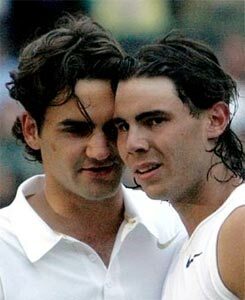 That would be tying Pete (Sampras) which I think would be absolutely fantastic. I am dreaming of the title. There's no denying that."